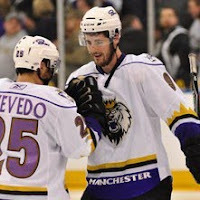 Earlier this week, Bud Holloway scored his team-leading 26th goal of the season for the Manchester Monarchs. Holloway has a special relationship with the back of the net. Already a playoff hero from last year – when he tied an AHL record with six game-winning goals during the post-season – he’s continued to produce on a regular basis. The 6’0″ left wing was selected by the Kings in the third round of the 2006 NHL Draft. He went on to play two more years with the Seattle Thunderbirds of the WHL, then split time between Ontario (ECHL) and Manchester during the 2008-09 season. After leading the Reign in playoff points that year, he’s been in Manchester ever since. He added to his resume last season, leading the Monarchs in assists (28) and points (47). And he’s found a way to top that this season, already posting 56 points (26g, 30a) with a handful of games remaining. 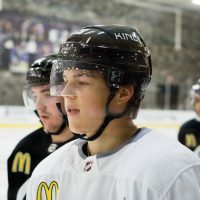 A few days ago he was voted the 2011 Monarchs ‘Man of the Year’ for his involvement in the community and is now one of 30 finalists for the league award. MM: You’ve had a great season so far. What do you attribute the success to? BH: I want to build towards becoming a better player. I try to do that every year. I don’t want to give too much back. I’ve had some fairly successful seasons, so anything less than the year before wouldn’t be continual growth. I use that as a marker and just try to keep moving forward. MM: Was there anything you picked up on or learned over the summer that you’ve specifically been trying to apply to your game this year? 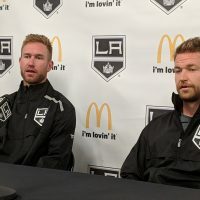 BH: There’s so much of the on-ice stuff that I learned from the Kings coaches and our coaches down here…and even from talking with other players, like little tips, little things – whether it be an actual physical act of the game or something mental, like not getting discouraged if the goalie makes a nice save on you. You can dwell on that and it can really impact your mental psych and the way the next shift goes for you. There’s so much wrapped in. So, I wouldn’t say there’s one main thing that’s been a focus. But, there’s so much I’ve learned and I continue learning. Hopefully, I can put all that towards what I’m doing on the ice. MM: When you first turned pro you spent some time in Ontario. The Reign have stugled quite a bit this year, do you still follow them at all? BH: I still like to stay in touch, so I read online to see how everybody is doing. I’m still friends with a couple guys down there too. I don’t want to forget it because it was something that really helped my career. It was something that was very useful for me. So, I don’t really want to put it in my rear view mirror. But, at the same time, I want to move forward and be productive in Manchester. MM: Let’s talk about some of the other guys who are there with you. What do you think of rookie Brandon Kozun and the year he’s had so far? BH: He’s been outstanding. He’s played well for us. He has 21 goals and that’s exceptional for a young player to produce like that. He was obviously a great scorer coming up through junior hockey and he’s been able to carry it over to the pro game. People are hard on him because he’s a bit of a smaller guy, but he’s still a great player and he gets in there just like a six-foot guy would. He’s doing great for himself. BH: I thought he should have stayed up after his 19-year old season. He earned the call-up though. He had over 20 goals here this year (23) and he’s been so big for us. It’s hurt us to lose him, but obviously we loved to see him get the call-up. 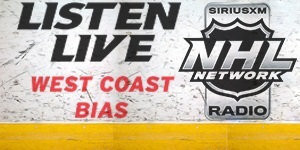 MM: What about the big center iceman, Corey Elkins – any thoughts on his season? BH: I think Elkie is one of the most underrated players we have on the team. His skill set is just unbelievable. Every game he does a move that is just so powerful and he’s such a smooth skater that it’s really quite remarkable. He’s a great offensive guy, he’s smart with the puck and the way he can control the puck with his body and his skating is just awesome to watch. MM: You’ve spent most of the year playing with Justin Azevedo and Dwight King. Is it safe to assume King handles most of the rough stuff on that line? BH: Ummmmm….I like to get in there too. He’s good for me and Justin because he’s a big bodied guy and we want the puck. 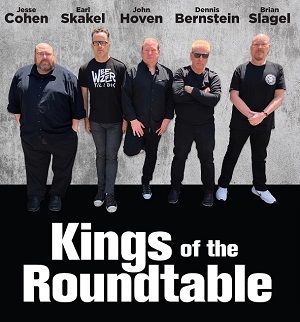 Kinger can get in there and get it to us. But, at the same time, he has over 20 goals too (24). So, he’s a pretty complete player himself. We compliment each other well, I guess. They’re fun guys to play with and we have quite a few laughs when we’re on the ice together. So, it’s pretty fun. MM: Away from the rink you’re living with Azevedo, Marc-Andre Cliche and Rich Clune. Has anybody pulled a good prank recently? BH: Justin and I were coming home one night and we were walking because it was a nice night out. Cluner was sleeping. Azzy went up and banged on his window and Rich just about jumped through the roof. I think he thought he was being attacked by some kind of wild animal or something. It was pretty good for a laugh. MM: What was the payback on that one? 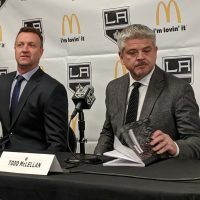 MM: The Kings were short on left wingers earlier in the season, especially before the trade for Dustin Penner. At some point, were you thinking you’d be getting the call-up? BH: It’s always in the back of your head and obviously that’s what you’re building towards. But, it’s something that’s totally out of your control. So, I’ve just tried to play well here and if they need me up there, so be it. If not, I can’t let it effect me to the point it’s effecting my game played down here. MM: Which Kings player do you think your game is most similar to? BH: I’d probably have to say…Justin Williams. Obviously, I’m not that caliber yet. But, kinda similar in that he puts up a few goals and stuff, but he gets in there too and he’s a pretty good skater. 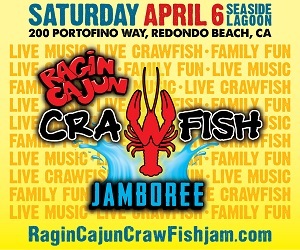 I know if I was up in LA that wouldn’t be my role though. I’d be more of a third-line checker or something like that, which I can gladly do. MM: Back to the Monarchs, what’s it going to take for Manchester to go deep in the playoffs this year and what type of things do you guys still need to work on in the final few games of the regular season? BH: There’s nothing really glaring that we need to work on, just sort of tighten everything up before the playoffs. We need to get everybody on the same page and do the little things that will make us successful. It’s not so much preparing for these last games, it’s preparing for something way bigger than that. It’s almost another season when you get into the playoffs and it’s a lot different hockey. So, I think we need to find a way right now to slowly ramp up our energy and gear up for that first game, whoever we face. MM: You’ve done some blogging and some online videos – what’s next for you in that area? Any more movie reviews, book reviews? BH: Hopefully, I’m going to try to send some of those Bud Visions (online videos) to a network and try to get picked up like that. I don’t imagine it will happen, but who knows what my PR skills will bring me. Well, before he gets around to sending those tapes out, Holloway still has five games left in the regular season and then hopefully a long playoff run. Tonight the Monarchs are in Worcester to take on the Sharks AHL affiliate and then they’re home tomorrow night to battle the Portland Pirates – the team they trail by just three points for the Atlantic Division lead. Just like Bud knows goals, he knows the Pirates too. 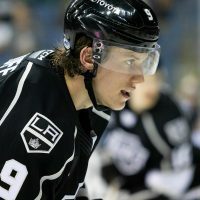 He scored his first professional goal against them in October 2008 and had the game-winning goal in each game of the Monarchs four-game sweep of the Pirates during last season’s playoffs. Perhaps he’ll have a little more magic in store tomorrow night.